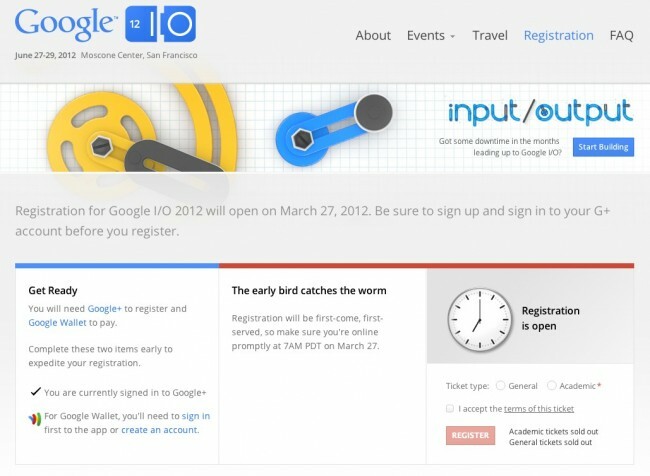 Google I/O 2012 registration opened at 7AM Pacific and appears to have sold out in 28 minutes. Even with raised prices and a third day added on, developers and Google enthusiasts in general, flooded the system. In fact, most people were greeted with a “checking for tickets” screen before being timed out. Once you were timed out, it seems as if you were dead in the water, as you had to head back to the registration page and start searching all over again. By that time, the tickets were likely gobbled up. Hopefully at least some of you got in! We will be there covering it live, so if you didn’t, you can follow the entire week through us. Or you can cruise over to Craigslist in the next hour and probably find some for double the $900 price tag. Update: Tickets already going up on eBay for as much as $4500. Scratch that, seller pulled it.